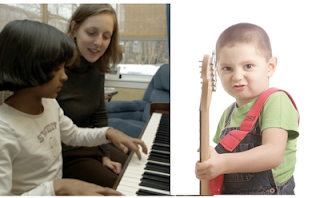 Guitar Blog: Are piano students just better students? In my early years teaching guitar I worked along side a piano teacher. We both had roughly the same number of students but there was an obvious difference. Almost all of her students were improving at a good steady rate whereas my students were inconsistent. At first it wasn't so obvious but after a year or so the disparity between our students was quite remarkable. What made me really take notice was the low turnover of her piano students compared to my guitar students. The piano teacher rarely lost students whereas for me it was almost a weekly occurrence. I know it wasn't personal because many students did not want to stop lessons but their parents realised it was pointless due to the obvious lack of progress. I remember coming to the conclusion that piano students were just better students but as with many untested theories it turned out to be a false conclusion. The difference was the teacher not the students. One afternoon the piano teacher rang me and said she would be late and asked me if I could explain the situation to her students. I was free so rather than leave the student waiting idle I asked him to show me what he was learning. Immediately he proudly showed me his practice log pointing out how much practice he had done during the week. On closer inspection I could see his log was filled in almost every day. When he began to play I asked how long he had been learning and I was stunned to learn he had only began 6 months earlier. When the next student arrived the story was much the same. I then asked the teacher whether she believed the practice log made a difference and her response was something like "I am not sure but I do know the students who use the practice log tend to progress faster". It was time to run an experiment. I divided my students into two groups. Group A kept a practice log. Group B did not. Group A students soon moved ahead of group B students in most cases. The practice log really did make a difference but I was not sure why. I decided the best way to find out was to use one myself. What I noticed almost immediately was a feeling of accountability. If I did not fill in my log I felt I was letting myself down. There was also a kind of self competitive desire to increase my practice time. If I did 20 mins a day this week I wanted to go for 25 mins a day the next week and so on. If my record for a month was say 4000 minutes I felt compelled to beat my high score the next month. Measuring my practice times motivated me to do better. It's a strange phenomenon but one that works. It's the reason video games are so popular. Most video games are pointless and do nothing more than make you better at the game itself. Let's face it, nobody really cares if you have the high score on a video game yet people are driven often addicted to improve on their score. As you can see if you want to improve your guitar playing start by measuring your practice. I did learn another very important lesson from the piano teacher which I will share in my next blog.